Chinmaya Vrindavan invites you to attend discourses on Power of Faith, based on Bhagavat Geeta Chapter 17 by our own Swamiji, Swami Shantanandaji. Yoga of Threefold Division of Faith: Know what are the different kinds of faiths. How one comes know and connect with various faiths. By going through all activities of life, how one can learn & develop a real faith in oneself and become successful in every undertakings. About Swamiji: Mesmerized by Pujya Gurudev, Swami Shantananda in sixties, then Br. Raghavan, went to serve the Master for almost two years as his traveling secretary. After completing his Vedanta course in Mumbai, Swamiji traveled to Taiwan where he successfully managed his own business while teaching Vedanta part-time. 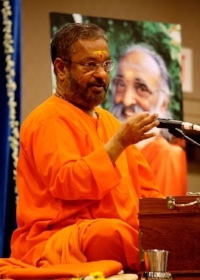 Since 1992, when he was given Sannyas by Pujya Gurudev, Swamiji has dedicated his life to the full time teaching of Vedanta in the Pennsylvania, New Jersey, New York area.